It’s here! The PANTONE Spring 2015 Color Report. Fresh, retro and fun! 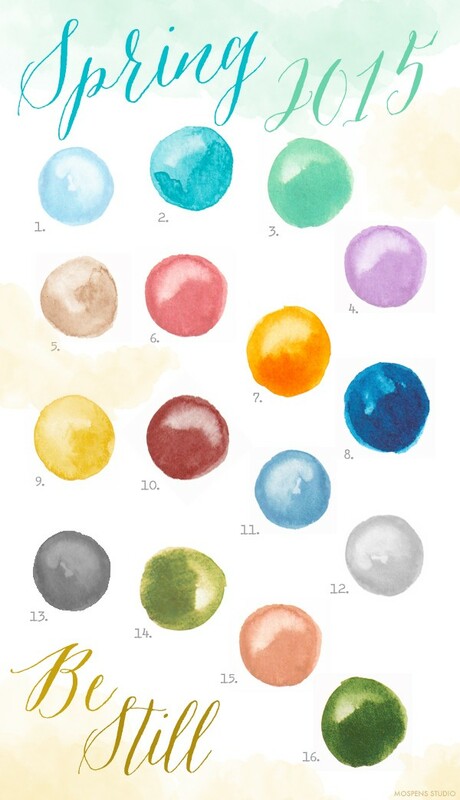 A lovely cool, calm collection of softer hues were chosen by the experts at PANTONE. Pale pastels and beautiful neutrals giving a nod to retro colors. Tropical colors for warmer spring weather are perfect. Escape the hustle and bustle from the busyness of everyday life with this collection of Spring colors. Subtle warm tones inject calmness. 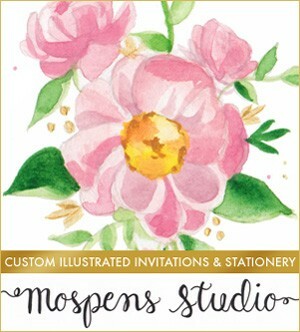 At Mospens Studio, we are happy to incorporate the freshest hues into your custom invitations and stationery! After you order, just tell us the colors you are using and we will pair them together perfectly just for you. It’s that time of year… Fall leaves are changing their brilliant hues. 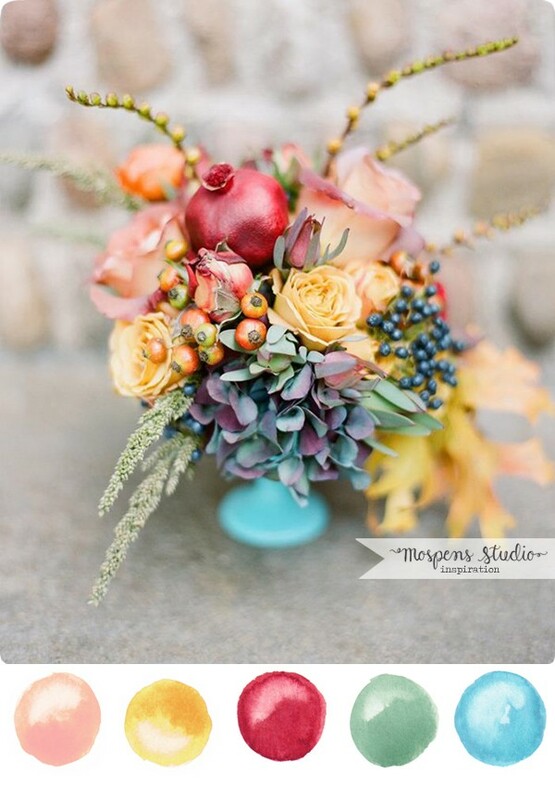 I adore fall and love this classic autumn themed color palette. Rich red, orange, green, deep mauve taupe (I love this color!) and light yellow orange. 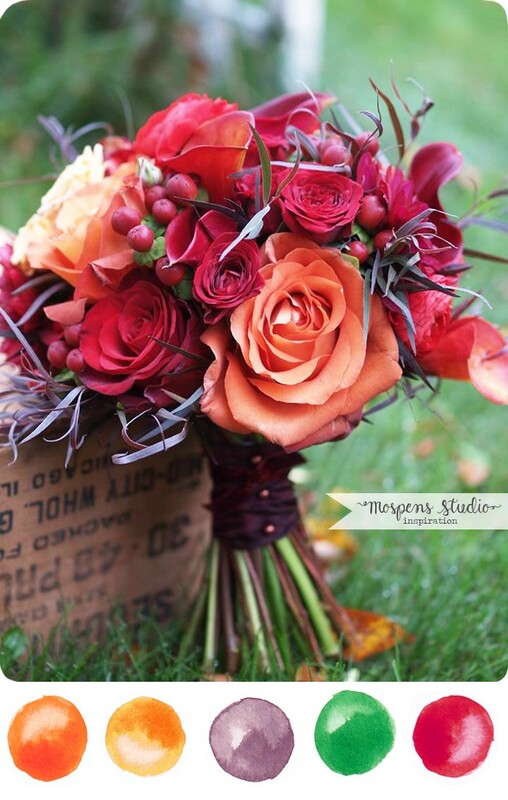 This is the perfect fall wedding bouquet. Wedding flowers by Alluring Blooms. I’m in love! 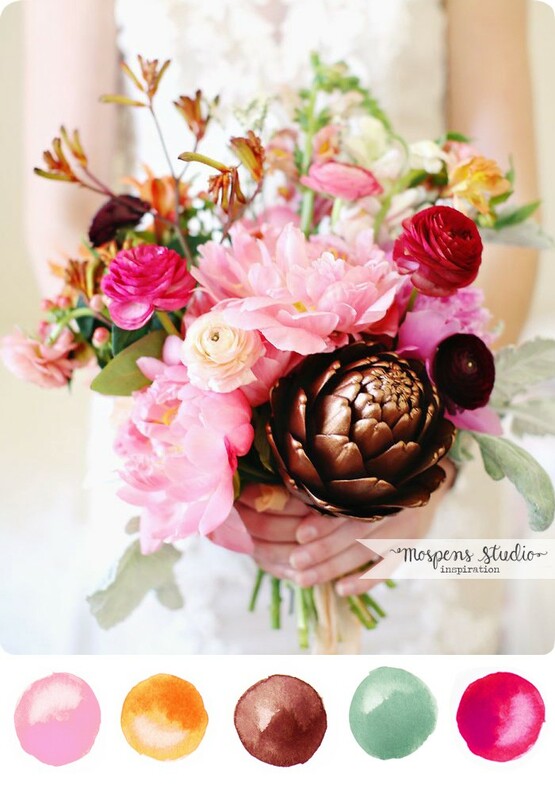 This lovely color palette of soft fall hues is perfect for a fall wedding, event or your home decor. When you think of fall you think of all of the brilliant autumn colors, muted fall tones are just beautiful. The fresh blue and red pops with the soft peach, golden yellow and background of cool sage green colors. Sources: Photo is by Julie Cate and fresh floral design by Bareroot Flora. Giving thanks and receiving a thoughtful note feels good. 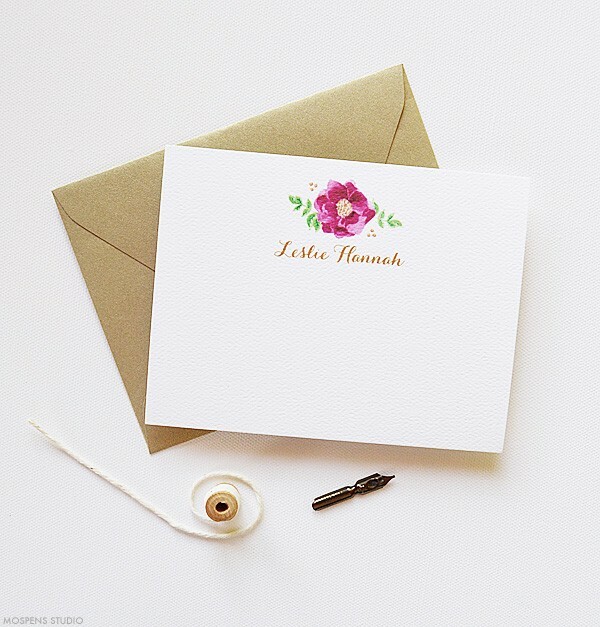 Make sure your personalized stationery notes match your personality. My five new note cards will help you do just that. 1. Sweet & Golden – Sangria and gold personalized stationery notes with watercolor illustration. Our felt stock has great texture and mimics watercolor cardstock. 2. 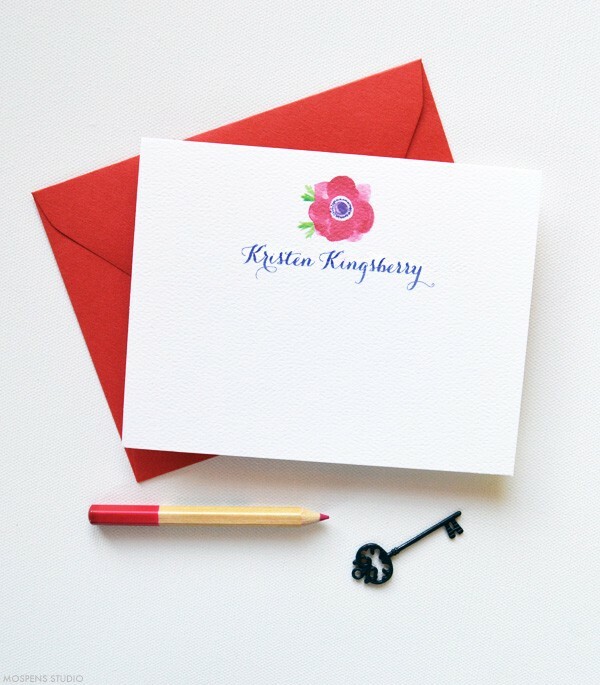 Sweet Anemone – Bold red anemone illustrated in watercolor (my favorite) add punch to your note! Red envelopes to match of course. 3. 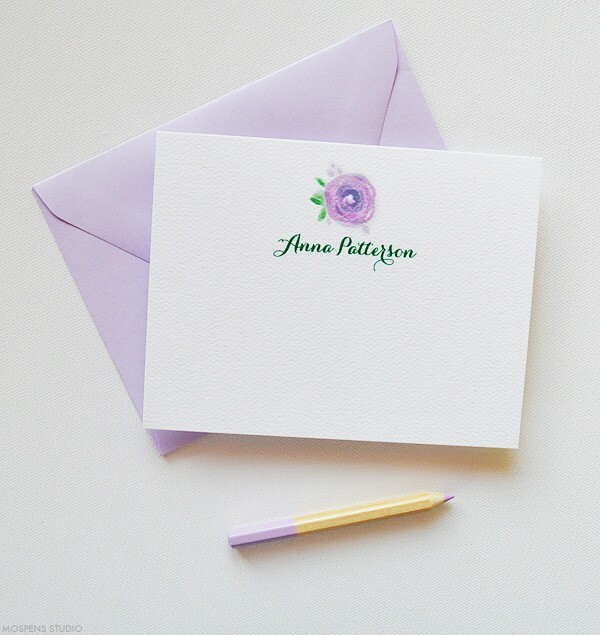 Lovely Lilac – Light purple watercolor flower is super sweet and perfect for a thank you. 4. Flirty Floral – If you love pink, you will adore this delicate pink flower notes. 5. 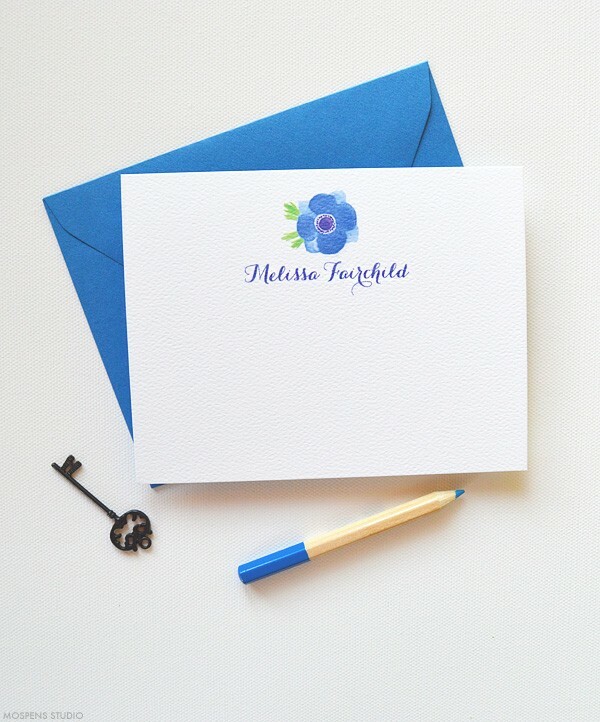 Bold & Beautiful – A brilliant watercolor blue anemone flower with matching envelopes are perfect for your personal stationery or for a gift! Q. When do I mail our my thank you notes? A. The day you receive a gift or within a week of the occasion that is prompting you to give thanks or write a sweet note. 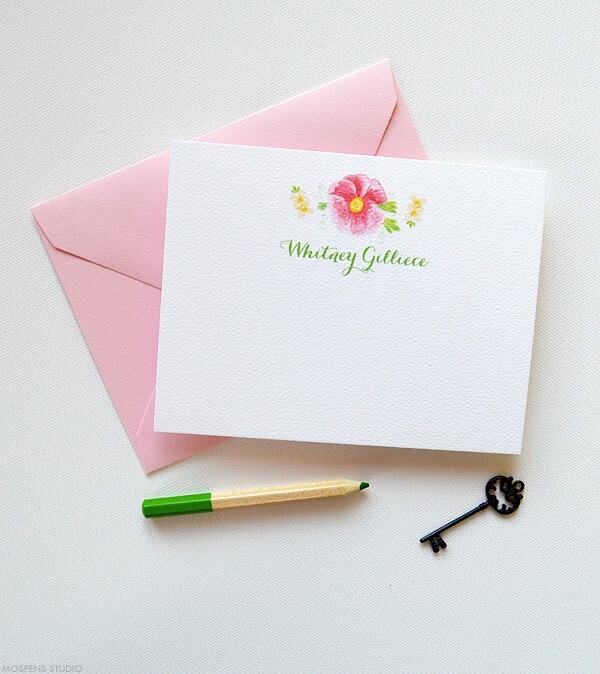 Custom personalized stationery notes are made to order and are customizable to match your personality. Contact me today to get started. Hellooo! When I saw this amazingly bright bouquet of flowers photo by April O’Hare Photography, I dropped everything and painted what I saw. What a gorgeous combination of bright colors. I thought, they are just perfect for a summer wedding. Bundled in a vintage silver tin can wrapped with burlap and lace, I fell in love. The splash of plum and sunflowers make this wedding bouquet pop. I think I need to create three of these as centerpieces and add them to my kitchen! So beautiful and super sweet. Today, I am featuring the perfect color combo with late summer and fall hues. Fabulous for a late summer or fall wedding. The pink, bronze, and hot red pink caught my artistic eye. Splashes of light orange paired with light sage seemed perfect. This GORGEOUS photo by Kay English Photography was just too stunning NOT to share. See even more inspiration on Style Me Pretty. Metallics paired with rich colors create a fresh wedding color palette. I am loving this fresh BRONZE metallic with bright hues. This combination is fresh and completely modern. SWOON! 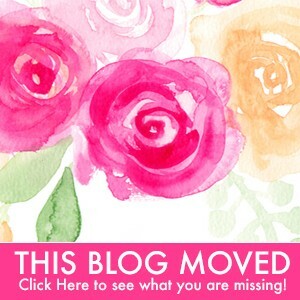 I am beyond inspired to create custom wedding invitations to match!